Architectural drawings are more than just a floor plan and elevation. There is a great deal more information that needs to be communicated through a set of construction plans than just the general design. In fact, though the home design floor plan and elevation are important, the majority of drawings in a complete set of working drawings have more to do with how to build what is shown on the floor plan and elevation. Here some basic types of architectural drawings and tools related to them. You can think of a floor plan as a drawing of the design objective. A floor plan lays out a two dimensional view of the placement of walls, equipment, appliances and special features that address the overall design of the home on the horizontal plane. Floor plans include dimensions between walls, wall thicknesses and provide the opportunity for labeling and laying out certain design features. Floor plans also allow a place to cross reference interior elevations and cross sections that are included on other sheets or in other drawings in the set. However, a set of construction plans need to go well beyond what is included on a floor plan. Site plans that are on undeveloped or underdeveloped ground might also include a demolition or removal plan for existing structures, vegetation or features that might need to be removed in order to build a home on the property. Where the floor plan was a two dimensional representation of the design objective on the horizontal plane, an elevation shows the design on the vertical plane, or what the walls and roof would look like if you were facing them. Elevation drawings can include front, back and each of the two sides of your home. Like floor plans, elevations provide a place to label certain design features and materials as well as reference details and cross sections that are included on other sheets of on other drawings. Elevations also include dimension lines that correspond directly to dimensions included on the floor plan which relate to the exterior wall and its features, such as windows and doors. Detail drawings go into greater detail concerning how the foundation, walls, roof, cabinetry and special features of the design are to be constructed. Detail drawings include such things as interior elevations, enlarged plans or elevations of a particular feature, and cross sections. They typically show more specific design features, more precise dimensions and specify the use of particular materials and construction methods. In essence, they are the nuts and bolts of a set of construction plans. Cross section drawings are a type of detail drawing that cuts through the vertical plane so that a builder can get a view of how the home is constructed. Cross sections are typically referenced on both the floor plan and elevation plans with an arrow indicating the direction that you are looking when you view the cross section. Cross sections can show the overall, general view of the whole house or a larger view of a particular portion of a wall, foundation or roof connection. Cross sections show detailed dimensions of specified materials and their placement in the construction process. They can also show the construction of such things as fireplaces and custom cabinetry. Working drawings refer to a set of construction plans. Working drawings are sometimes referred to as a building set and include site plans, floor plans, elevations, cross sections, interior elevations and detail drawings. They will typically also include a foundation and roofing plan as well as a plan for electrical outlets, lighting, plumbing and mechanical features. These drawings are necessary to specify the materials used and how the finished design is to be put together. The drawings in a set of working drawings or a construction set are done in a two dimensional view, however, it is sometimes difficult for people to see exactly how their finished home will look in our three dimensional world. In order to help clients get a better overall picture of their design, but are of little use in the construction process. Isometric projections are drawn by extending a particular corner vertically and then extending correlating horizontal lines at 30 degrees from the vertical point where the three meet. Axonometric projections are the same, but extend 45 degrees and are typically more useful to show interior instances of a drawing where isometrics are used for exterior. Presentation drawings often include isometric and axonometric projects as a part of a presentation. Presentation drawings are also not helpful in the construction process, but are useful in showing clients how their building will look in a three dimensional finished state. Presentation drawings often include design features, furniture, people, automobiles and landscaping in an attempt to create a view of what the building and its surroundings will look like when it is in use. These buildings are often used in fundraising or scenarios when designers are competing for a contract with a client. Survey drawings are legal documents that are created by a licensed surveyor. Survey drawings are a map of a property which outlines its boundaries and physical dimensions, as well as the relative position of the house, sheds, fences, and other structures on the property. These drawings are an essential part of beginning the construction process and provide the proper orientation for laying out site plan drawings. Without a survey drawing, you risk intruding on or placing structures on property that isn’t legally yours; something that can open up a whole can of legal issues that you don’t want or need. Record drawings are a revised set of drawings that are submitted after the completion of the project. They are called such, because they are the drawings that will be put on record with the city. These drawings reflect dimensional, specification or design changes that took place while the project was under construction. Record drawings might also be referred to as “as built drawings” and they are usually what are referred to for taxation and other legal purposes. Drafting is a process by which a draftsman, architect, designer or engineer communicates how something is to be designed or built. Draftsmen are experts at taking a visualized concept and creating a two dimensional or three dimensional rendering that can be used as a map to guide a builder through the construction process. Before computers came into play, drafting included the use of a particular set of geographical construction instruments including: drawing pencils, t-squares, triangles, protractors, compasses, scales and templates. Drafting before the computer age also included one more essential tool that is likely the reason that computer aided drafting was invented; an eraser. CAD, computer aided design or drafting, is an essential tool in our modern age. Because drafting longhand takes so much more time and changes have to be made with an eraser, CAD has greatly enhanced the speed and accuracy by which drafting is performed. In addition to being able to draw with more speed and accuracy, a draftsman, using CAD can create three dimensional renderings for presentation with ease. There are different levels of CAD on the market, which even beginners can learn to use, though most of them do not have the necessary features to create a set of professional working drawings. 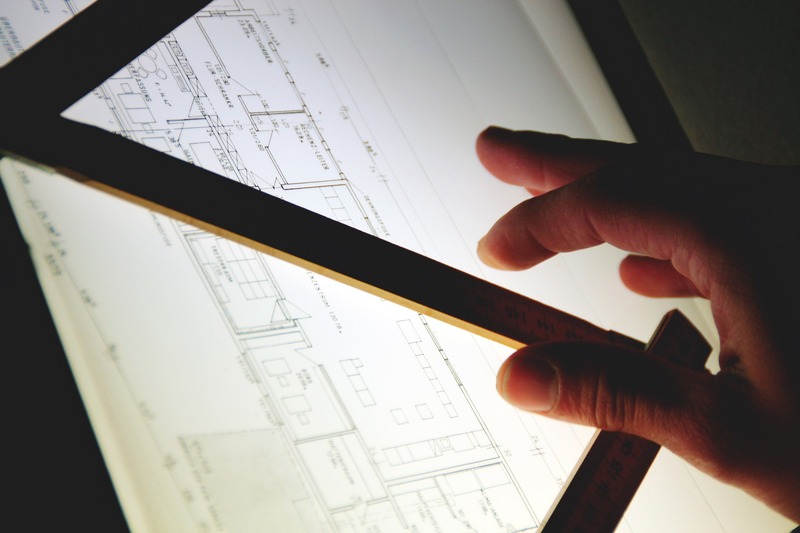 Since builders can’t build a building by looking at a computer screen, architectural reprographics are a necessary part of the designing and building process. In essence, CAD drawings are printed on large sized laser printers that produce scale drawing sheets from which blue prints are made. Though the process is much different from what it used to be, blue prints are essentially copies of the original printed drawings. Architectural drawings provide a road map, so to speak, for the builder. Within a set of working drawings or construction plans, draftsmen, designers, architects, surveyors and engineers provide detailed instructions that lead to the finished design objective, which is the construction of your home. If you need more living space in your home, you might consider turning your face upward, not necessarily for divine guidance, but toward developing that space in your attic. Depending on how that space is used, designing an attic conversion has its own set of challenges to prepare for. Here are some considerations to take into account as you plan. Creating an open structure ceiling is, essentially, removing the flat ceiling and exposing the roof structure above it. This is sometimes done to make a living space feel more open and airy. Besides the challenge of making hidden structural members attractive, you need to take into account any structural support the ceiling joists lent to the overall strength of the roof and wall design. Simply removing the ceiling and ceiling joists can cause the roof to collapse or for walls to cave in. Make sure that you make plans for proper support of your home’s structural members if you decide to go this route. Additionally, you’ll need to consider the insulation value that your attic provided and make adjustments for that loss. Can you maintain headspace throughout the room’s living space? Can you create windows for proper egress from a bedroom according to the Life Safety Code and local building code? Will the existing structure support the weight of furnishings and use? Keep in mind, as you plan, that ceilings usually weren’t meant to be floors, so they may not support the extra weight without being beefed up and that rooms that are used as bedrooms have certain code requirements that other rooms don’t have. Similar to the open ceiling concept that we discussed before, creating a loft requires opening up a portion of your attic space to serve as living space in another room below or adding a structure to an open structure ceiling. Some of the concerns from both of the above will apply to this renovation. You will need to provide headspace and structural support for the floor of your loft. An additional concern with adding this structure is providing access to your new loft via a ladder or stairway. Some homes already make use of a portion of attic space for creating bedrooms. In such homes, the required windows for bedrooms are typically installed in the gable ends of the home’s structure. Creating windows and additional room space in an attic type bedroom will require installing dormer windows. In essence, you create a new wall and roof structure that extends out through the attic space in order to align with the wall below the room. The floor of a dormer window will become living space, so you will need to be certain that it will support the additional weight, just as we discussed above. If you create living space in your attic, you’ll have to create a means to access that living space with some sort of stairway. Stairways can become the trickiest part of creating new living space in an attic. A stairway tends to take up a great deal of space in the room below as well as the room above. Another tricky part about stairways is that they require vertical head space as much as they take up square footage from your floor plan. A common solution to both of these space issues is the use of a circular staircase. Again, be certain that you provide the structural support for this weighty member above, below and from side to side. We mentioned before that attics tend to provide a space for insulating your home. When you take away that insulating space and making it into living space, you increase the amount of energy that you will need to heat and cool your home. Be conscious of the fact that you are eliminating that layer of insulation and plan to make up for it in another way. 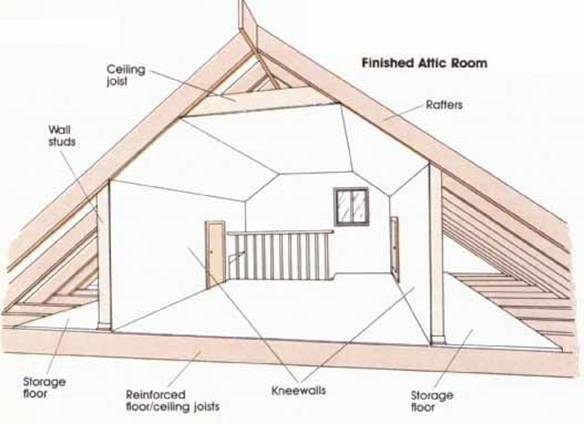 There are a number of tricky structural and code concerns that come into play when you incorporate attic space into living space as an open structure ceiling, a room, loft or dormer window. To make sure that you provide what is necessary to meet code requirements and structural demands, consult with a professional. You can make use of that already built space, but if you don’t do it properly, it do a great deal more harm than good.